Christmas is approaching, and your child has likely drawn up a sizeable gift list already. One of the challenges of fatherhood is teaching your young one the value of giving rather than receiving. Proper planning and small talks with your kid will help you prepare for this holiday season. First, recognize that your child’s list stems from successful marketing. Your kid isn’t aware of business strategies and buys into them. Therefore, try to limit the amount of advertisement your young one is exposed to. Opt for home media instead of television, play CDs in the car instead of the radio and toss out toy store circulars. Next, you’ll have to make giving presents fun. Start by making simple hands-on gifts such as holiday cards with your child. Then take him or her around the neighborhood and have your young one hand out the handmade items either in-person or anonymously, depending on his or her preference. Some children may prefer seeing the smiles of recipients, while others may enjoy the more secretive approach. 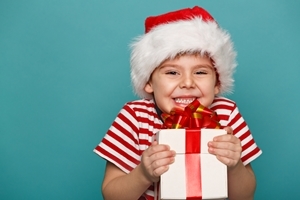 Once your kid spends less time being bombarded by advertisements and more time making and handing out presents, he or she will start to appreciate the gift of giving more.